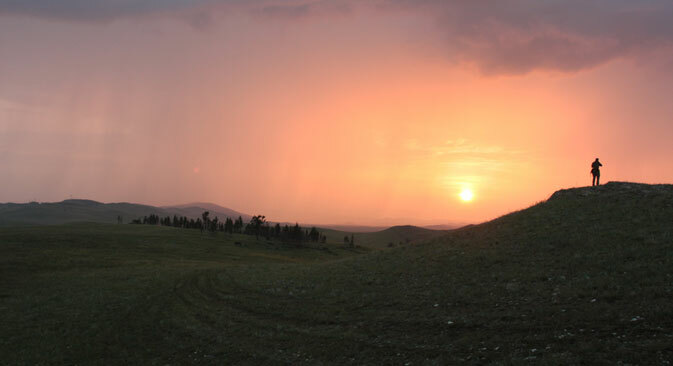 Khakassia State Natural Reserve has recently celebrated it’s 14th birthday. This summer, in the Itkul freshwater lake, located in the reserve, the Russian Geographical Society conducted an onsite seminar – the subject being the protection strategies for rare species of large mammals. Today one can get access to the reserve’s territory only with the administration’s permission. Our RBTH correspondent has seen for herself how the work on the new reserve is organized. On the cordon’s territory there are several wooden houses, two stylized tents, a sauna and a small power plant, powered by the sun and wind. Recently, the number of buildings has increased – there is a new visitors’ centre. It is a museum, an auditorium, and a vantage point in one – the panoramic windows open to a beautiful view of the lake. The opening of the visitors’ centre is an event associated with the three-day seminar dedicated to the study of rare species. Zoologists watching snow leopards, tigers and other leopards came here from different sanctuaries. The scientists’ working schedule is very tight with fieldwork, processing of the data and preparing for new expeditions. Sharing experiences is vital for zoologists. For example, advice about which battery is better to use in the camera traps, can play a crucial role in the expedition being successful. Winter is the key time of the year for the workers of the Sayano-Shushensky reserve. After all, it is in winter that the expedition sets out to the snow-covered remote locations, inhabited by ounces and snow leopards. The traces of a live leopard are best visible in the snow, and the enthused scientists are looking forward to this period. "We have three months to collect as much "live" data as possible, during this period we are "writing a book." And the rest of the year is spent on its decoding" – says researcher Sergey Istomov. The emergence of camera traps has led to dramatic new results – "In less than ten days, we got our first photos of snow leopards. And they were three different animals – for such a secretive animal, this can be considered a huge success! By the way, a funny story turned out with the third leopard – at first, we could not see it properly. But after a while, my son, having looked at the picture, asked me: "Daddy, whose feet are they on the rock?" It turned out that the leopard was slightly above the lens, so the camera only registered his limbs, which at first no one could see." – says Istomov. Over the past four years, camera traps recorded 15 species. While in the whole of Russia’s territory the number of ounces estimated by WWF was less than 90. Every Russian reserve has a large staff of inspectors working there, they patrol the border around the clock. Often reserves occupy inaccessible areas – under such conditions implementing complete control is not possible. Poaching and illegal presence in the reserve is still a headache for its employees. Poachers rarely come just once, after all, one can get a lot of money for the sale of rare fish or game. Recently, in Russia, a new type of poachers emerged - "poachers-advertisers." Senior Inspector of the Khakassia reserve Vladimir Savitski said: "Today, underwater fishing is very popular. Shopkeepers of spear fishing equipment come to our lake to catch the big fish, take pictures with it, put the photo on the website and attract more buyers. They assure their customers that by using their equipment, they can catch rare fish of this size..."
There are also less dangerous offenders – people who just want to relax in silence, far away from the bustle, but they can cause damage to nature – lighting fires, leaving rubbish behind and scaring away rare birds. The work of the inspectors at Lake Itkul looks much the same as that of inspectors at other reserves. Inspectors work in shifts – a week after two. During the day, the task force makes several raids – by boat or by car around the lake. During the aquatic raids, the inspectors often have to remove poaching nets set up by the residents of the nearby settlements, who still haven’t come to terms with the fact that the usual fishing spot is now located in a conservation area. After making a 40 km trip by car, the inspectors look out for intruders from the tops of high hills. The area of the lake Itkul is relatively small, so experience and insight help the guards protecting the sanctuary’s order notice even those who use the coastal forests as camouflage. Despite their harsh work and endurance, the inspectors treat each violation with an equal amount of care and attention. "In winter it is quiet, and when the warm season approaches we start working actively. In the spring there is an uncomfortable feeling that once again we will have to teach morals, do some explaining, issuing of fines" – senior inspector Vladimir Savitsky complains. It seems that the inspectors’ main weapon is their word. And this is no accident. Today the reserve system is increasingly focusing on environmental education. "We try to gradually move away from strict prohibitions to enlightenment" – said Julia Surman, deputy director for environmental education, tourism and recreation of the Sayano-Shushensky reserve – "In every Reserve there is a whole department engaged in this. Their task is to convey the idea to the reserve’s inhabitants, to explain that the protection of wildlife is a necessary measure. " In the interests of nature the flow of people to the reserves is limited, but it is still possible to get here – as part of a special group or as a volunteer. Director of Khakassia Reserve Viktor Nepomnyashchii says: " We are working with the students a lot - from childhood we instill in them how to love and care for nature." Ecological volunteers are also welcome here. The methodologist of the Education Department Juliana Kuimova says: "You can help the Reserve by participating in the "environmental task force, and in the improvement of tourism infrastructure. Those who can make a contribution to environmental education are also in demand here – photographers, video operators, translators. We will try our best to make it interesting and comfortable for volunteers, but we would also like to get real help from them."